Entertainers have historically been too risky for traditional carriers to insure due to a variety of factors. Some companies are uncomfortable with the many months of unemployment in between jobs or the royalty income that would inevitably continue even if a client were to become disabled. Additionally, many entertainers have seven figure incomes and require large monthly benefits that traditional carriers cannot or will not provide. At first glance, these cases seem difficult to place, but the same is not true with the StarCoverSM Disability Insurance Plan. This plan has been customized to meet the unique needs demanded by high profile clientele and those working within the movie, television, and music industries. StarCoverSM features an optional disfigurement rider. When an entertainer is disfigured, they often lose their ability to secure work. With the disfigurement rider the policy provides benefits even if the entertainer is not disabled. Our “Your Occupation” definition of disability has purposefully been designed to allow an individual who is receiving disability benefits as an Entertainer to continue to collect benefits and simultaneously be employed in another occupation. StarCoverSM covers all entertainers and allows you to prescribe adequate levels of income replacement with monthly benefits from $1,000 to $100,000 or more and offers lump sum benefits up to $50,000,000 or more. 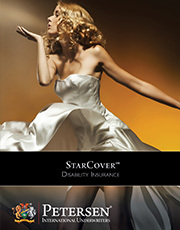 Make sure all of your clients are protected from the financial ruin a disability could bring with the StarCoverSM Disability Insurance Plan.